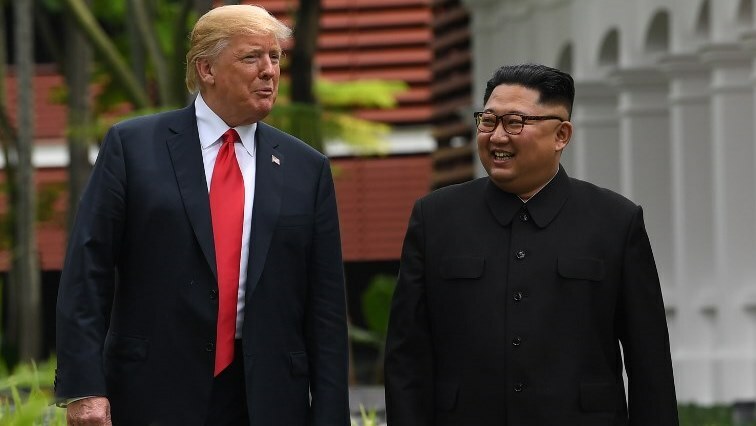 Trump to meet North Korea's Kim in Vietnam in late February - SABC News - Breaking news, special reports, world, business, sport coverage of all South African current events. Africa's news leader. U.S. President Donald Trump said on Tuesday he would hold his second meeting with North Korean leader Kim Jong Un in Vietnam on February 27-28, while giving himself credit for averting a major war on the Korean peninsula. “If I had not been elected president of the United States,we would right now, in my opinion, be in a major war with North Korea,” Trump said. Trump met Kim in Singapore on June 12 in the first summit between a sitting U.S. president and a North Korean leader.Trump has been eager to hold a second summit in spite of a lack of concrete progress in persuading North Korea to give up its nuclear weapons program. “The two leaders already took their first step in Singapore toward shaking off their 70-year history of hostilities. Now we hope that they will take a step forward for concrete,substantive progress,” Blue House spokesperson Kim Eui-kyeom told a news briefing in Seoul. It has also been used as a model of economic and political reform for impoverished and isolated North Korea to follow. That would require major changes to the North’s personality cult and”juche” ideology of self sufficiency. A source at Danang airport said four U.S. military V-22″Osprey” aircraft flew from Japan’s Okinawa island and landed in the coastal city on Tuesday evening. They left after a few hours, the source said. This entry was posted on 06 Feb 2019,12:18PM at 12:18 PM and is filed under World, Homepage Featured Story Slider. You can follow any responses to this entry through the RSS 2.0 feed. Both comments and pings are currently closed.